One of our five Guiding Principles is “Embrace Relationships” and that’s particularly true in our fundraising. Our donors and sponsors are also partners … people we can stack hands with for the long haul in impacting Denver. 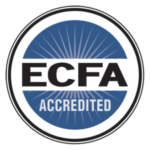 We are proud to be an accredited organization with The Evangelical Council for Financial Accountability (ECFA). The ECFA enhances trust in Christ-centered churches and ministries by establishing and applying their Seven Standards of Responsible Stewardship™ to accredited organizations. Tim McTavish is currently the Vice Chair of the Board of Trustees and adjunct professor at Colorado Christian University. He also appears on page 19 our our 2016 Impact Report! "In any given week, work dominates my time, therefore work is a place where I must bring my faith. I used to isolate my occupation from Christianity, but now I truly see my job as the place God wants me to serve. I invest in DIFW because it offers connections and support for those who want to practice their faith in every aspect in their lives." "I support DIFW because it provides our city both a vision for the true meaning of work as well as Vocation Groups that facilitate ways to creatively and practically apply it day-to-day. I also think it's great how DIFW is unifying so much of the Denver Christian community behind its redemptive mission."